Reglazing ceramic tile is a wonderful and cost effective solution to change the color of your White Plains NY bathroom tile. 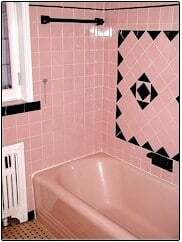 Do you have one of those dated bathrooms with the pink (or yellow or blue or green) tile with black lines? Did you know that there is a less expensive and less intrusive way to refresh that bathroom? Rather than replacing the tile (which can get expensive), if your tile is in relatively good condition (i.e. not cracked or falling apart), you do have the option of reglazing your tile. You can make it white or beige or virtually any color you would like. The bathtub refinishing process involves scraping, washing and applying solvents to the surface, followed by etching, neutralizing and sanding. Solvents are applied a second time followed by the undercoat and two to three coats of Surface Specialists® polyurethane coating. ; The process usually takes about a day and the refinished surface will have a high gloss and be as durable if not stronger than the original surface and easy to clean. Following proper cleaning procedures, such as using only non-abrasive cleansers and soaps, your newly refinished bathroom will look beautiful for 10-15 years. Refinishing (or reglazing) is one of the best options when the bathtub, shower or sink finish is worn, a color change is desired, or damage is scattered over the entire surface. We complete bathtub and tile refinishing in 1 day and you may begin using the surface by the next evening, saving you a significant amount of time and money. All work is performed on-site in the bathroom area with absolutely no mess for you to clean up and may be completed in virtually any color. Tile reglazing is much faster and more cost effective vs. replacing the tile in the bathroom. Many homeowners don’t realize the work that needs to be done when retiling. In addition to ripping out and replacing the tile, usually you need to replace the mud job on the floor, rebuild the walls and call in a plumber to remove and reinstall the toilet. This can get costly when you add up all of the work and you can often be without a bathroom for a week or two (which can be especially inconvenient if you live in a condo or co-op and only have 1 bathroom. Tile resurfacing provides a much faster, more convenient option which can save you money. It’s often a great option for those looking to sell their homes and fix them up without spending too much. It is also perfect for those moving into new homes with a limited budget at the time of move in. Reglazing can be a perfect solution to eliminate the unattractive colored tile while you save money to completely remodel the bathroom in a few years. We install new tile as well as reglaze existing tile, so if you are interested in tile reglazing or tile replacement, give the Flooring Girl a call at 914-937-2950.